27 boats descended on the very picturesque Tjeukemeer for the 2013 Javelin European Championships held between the 28th July and 1st August.Day one set the scene for the rest of the week with a steady for 4 to 5 blowing across the course which would make racing interesting and tiring for all competitors. The race officer set the first or a series of perfect Javelin courses providing high speed reaching, tactical running and a long beat to the delight of all the competitors.The first day saw a promising start to the event by the reigning champions, Jens and Jan Schlittenhard in GER 570 taking a win in the first race and a 3rd in the second. Leading after day one were Richard and Kathryn Smith sailing GBR 577 with a 2nd and a 1st with the new builder for the Javelin Class, James Jarvey sailing his new boat GBR 579 with Matthew House collecting a 3rd and a 2nd place.Day 2 saw the three leading boats being joined for line honours by 8 time European Champions Brian and David Earl who won the third race by an impressive margin and collected a 4th and 3rd in the following two races. Jarvey and House had the best day of the leaders collecting a 3rd place and two wins to put themselves in the lead overall on equal points with the Smith's who finished the second day with two 2nds and a 4th. 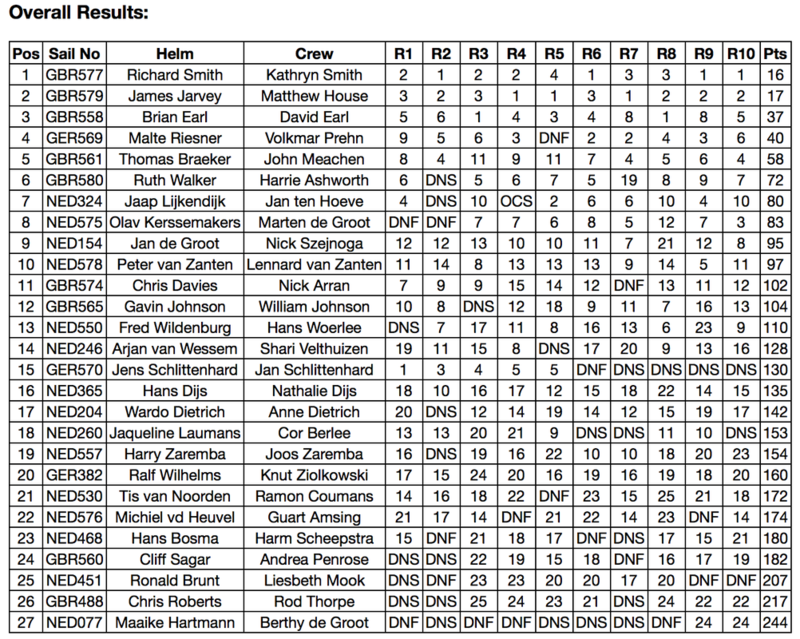 The Schlittenhard's remained in contention with a 4th and two 5th places.The third day of the championships was the windiest of the event and with a force 5 to 6 forecast the race officer wisely decided to only race two of the scheduled three races. The Smiths took the first race from Malte Reisner and Volkmar Prehn in GER 569 who were revelling in the windier conditions with Jarvey and House battling to the line with the Schlittenhard's when their mast failed which sadly put the them out of the competition.Jarvey and House won the seventh race of the series from Reisner and Prehn with the Smith's finishing third following a capsize on the run.Going into the final day the two leaders were still inseparable with Reisner and Prehn pushing the Earl's hard for third place. The Earl's responded by taking the seventh race from Jarvey and the Smith's.The Smith's fought back in the ninth race, winning from Jarvey which put the two leading boats back on equal points going into the last race of the series. Jarvey led from the Smith's at the windward mark, to be passed on the gybe but regained the lead and pulled away upwind. The Smith's managed to close the gap on the run and gybed inside Jarvey and were just ahead at the leeward mark. A very tense final beat was won by the Smith's by a very small margin to end a fantastic competition.All the competitors would like to thank our friends at the Dutch Javelin Association, Sponsors, the Race Officer and camping Tjeukemeer for hosting a truly wonderful event which was enjoyed by all who took part.